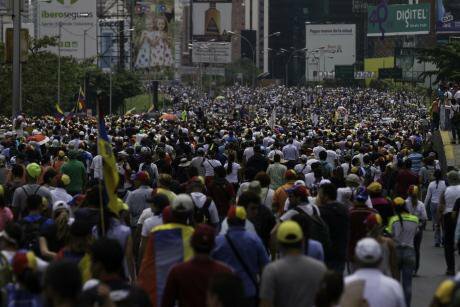 Opposition activists march along Francisco Fajardo highway, during a protest against President Nicolas Maduro in Caracas, on May 10, 2017. VWPics/SIPA USA/PA Images. All rights reserved. In October 2016, Venezuela’s National Electoral Council announced, without any legal justification, the postponement of regional elections. It said that the elections would be held at the end of the first half of 2017, even though the Constitution required them to be held in December 2016. Furthermore, it illegally suspended the process of staging a Presidential Recall Referendum, a right contained in the country’s Constitution, based on rulings from regional courts that do not have jurisdiction on electoral matters. In the first four months of this year, we have witnessed serious democratic setbacks, namely the unconstitutional decision of the Supreme Court on March 29 to dissolve the opposition-led Congress – a decision that had to be revoked given the strong national and international reaction. We have also watched with extreme concern the death of at least 57 people in the context of the repression of street demonstrations (a figure updated until May 25, 2017). In October 2016, Venezuela’s National Electoral Council announced, without any legal justification, the postponement of regional elections. On May 1, President Nicolás Maduro convened a Constituent Assembly whose members would be chosen by certain sectors of society and not by a universal vote. Venezuelan human rights organizations exposed the irregularities of convening the Assembly and called for the rejection of constituent processes in times of heightened political tension. They denounced that such a process threatened the reform procedures and the human rights guarantees contained in the Constitution and ignored the principle of the advancement of rights. The Maduro government has been facing growing isolation on the international and regional stage since its withdrawal from the OAS (Organization of American States). It is worth remembering that, in 2013, Venezuela rejected the jurisdiction of the Inter-American Court of Human Rights, the region’s highest rights protection body. The Maduro government has been facing growing isolation on the international and regional stage since its withdrawal from the Organization of American States. Human rights organizations from Venezuela and other countries have expressed their concern over the growing militarization of society. They recently condemned the approval of a decree to implement the Zamora Plan, also called the “Special Strategic Civil-Military Plan”. “This announcement constitutes the consolidation of the militarization of policing demonstrations and urban security, together with the employment of groups of armed civilians and police officers with the military mindset of fighting the internal enemy, which is right out of the national security doctrine,” say groups such as Provea, which has a long history of defending rights in Venezuela. In the first days of its implementation, the Zamora Plan was executed with total disregard for the principles of the proportional and differentiated use of force. This generated new obstacles to the exercise of the right to peaceful demonstration. The indiscriminate and potentially lethal use of toxic gases increased the number of detainees and regrettably the amount of people killed. It is essential for the Venezuelan government to commit to guaranteeing the full exercise of the right to protest and to strictly submit to national and international standards on the proportional and differentiated use of force. It is urgent to put an end to the Zamora Plan, to repeal the State of Exception and Economic Emergency and to respect in full the Constitution. Human rights organizations from Venezuela and other countries have expressed their concern over the growing militarization of society. In this context, the immediate scheduling of the pending elections for governors would represent an important step for the country. The government of President Maduro must guarantee the right for all Venezuelans to participate in elections, without discrimination. Furthermore, the government must cease plans to illegally convene a Constituent Assembly, stop preventing Congress from fully functioning and release a calendar for regional, municipal and national elections that observes the time frame established in the Constitution and that guarantees the right of participation for all Venezuelans, both as voters and as candidates. We urge the international and regional community to work together for this to occur as soon as possible.